Thousands of spectators who came to the Vysočina Aréna to watch both Sunday’s races in the elite category enjoyed epic cycling battles as both the women’s first and the men’s races later were decided on the finish line. Annika Langvad of Denmark celebrated her third victory on the local course, Nino Schurter was victorious in the Czech Republic for the sixth time! The traditional local hero, Jaroslav Kulhavý, finished ninth, the best Czech women finished 27th and 28th. Langvad, who came to Vysočina to try to follow up on her last year’s victory, moved away from the pack shortly after the start, and only Joland Neff could keep up with her. They cooperated perfectly for the whole race, and several hundreds of metres before the finish line, the Swiss racer seemed to be stronger. However, she hesitated for a moment at the beginning of the finish line, turned around after her opponent from the north of Europe, and lost the moment to respond to her attack. “I was afraid that Jolanda would get in front of me and build a gap, but I was sure that if I manage to keep up with her, I will be better on the finish line. In this respect, the Short Track race was a great lesson that I had learnt from. Moreover, I really love the Nové Město course, it is actually my favourite in the whole World Cup series,” the thirty-four-year old Dane smiled happily. Finish photo had to decide who took the gold in the men’s race, whether the current Olympic champion, or Anton Cooper of New Zealand. Schurter was a slightly faster, which means that he has not been beaten in the Vysočina Aréna for three consequent years. Before the Olympic Games in 2016, he had dominated in the World Championships in the Czech Republic, last year in World Cup had been golden for him, too. 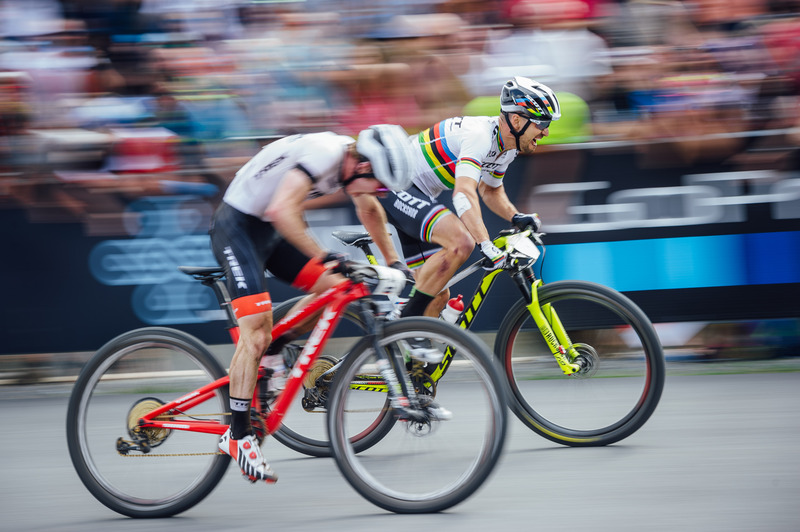 Early into the race, Nino Schurter set the pace with Van der Poel of the Netherlands, however, the Dutch racer crashed in the middle of the race and withdrew. Schurter cooperated with the two racers who eventually finished behind him. The Swiss ace stepped up the tempo in the last lap, and managed to get rid of Maxime Marotte of France. Cooper stayed with Schurter and seemed to be stronger in the spurt for the finish line. In the end, though, Nino was proven victorious by mere millimetres. Having started from the third row, Jaroslav Kulhavý rode among the best twenty, and managed to get better position in the end. In the last lap, he was about to attack the current fifth place of Manuel Fumic, but the bicycle decided otherwise in a climb with roots. “I wanted to shift gears but the chain got stuck behind the cassette, which meant that the podium became impossible for me,” Jaro complained. Despite finishing among the best ten racers in this year’s World Cup for the first time this year, he was far from satisfied. “I wanted a better result. Unfortunately, my legs were not OK, I missed about ten percent of output,” he admitted.